KINGSTON, NC — The days of horror in an election always come during October. All sides have saved their worst ammunition for one final broadside before election day. Hillary delivered her trove of salacious Trump tapes (surprising no one) just as Wikileaks continues to expose the dark underbelly of her campaign (surprising no one). Despite wall-to-wall media pundits being absolutely aghast at Trump’s behavior, and a blackout of Podesta email coverage, the “October Surprises” are duds. The only explosive bombshell launched by a campaign this year is currently rocketing into deep space on a collision course with a small asteroid. Lesser-evilism, as the strategic basis for a campaign, only works if you are demonstrably better, or worse, than your opponent. It says a lot that even dubious partisan polling continues to show a dead heat of despicability between the two. Desperate to break the Mexican standoff, the Hillary and Trump campaigns began this week to openly target third party candidates. Trump outed CIA operative Evan McMullin saying, “If they go enough for this character that’s running all over the state, and we lose the state of Utah, that’s devastating.” To his credit, McMullin has never made it a secret his only reason for being in the race is to deny Trump Utah. It remains to be seen if the CIA is just as effective throwing US elections as they are in South America. 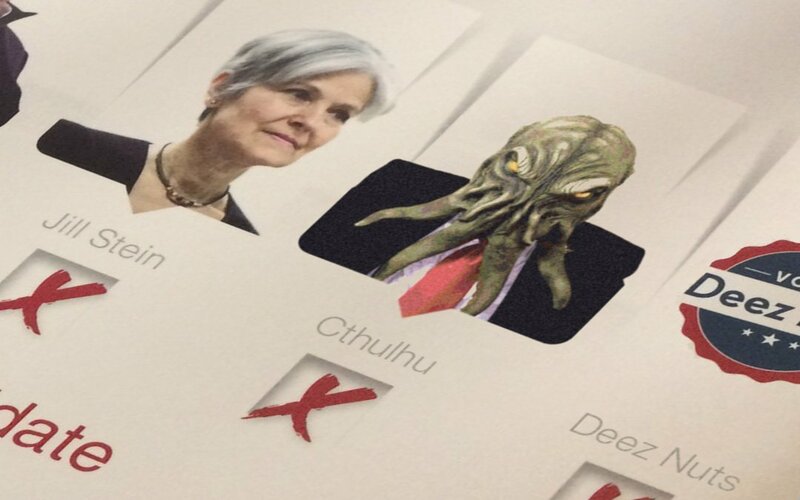 On the left, pro-Hillary PACs are dragging Johnson, Stein and Cthulhu into the fray. 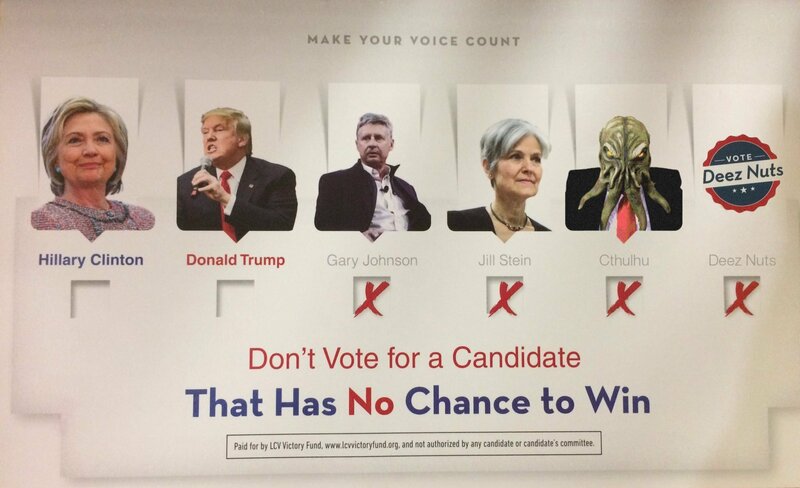 The League of Conservation Voters are distributing flyers with the stale lesser evil argument dialed up to 12. The un-American piece of agitprop is a crude bid to shame voters into sticking to the very script that has made most Americans rightfully despise the political class. “It was always inevitable it would come to this. The ‘unpredictability’ everyone seems to surprised about this election is just a byproduct of its artificiality,” said Cthulhu campaign head Eminence Waite. Cthulhu’s stance on climate change may have put him in the League of Conservation Voters’ crosshairs, but Ms. Waite explained it was simple economics. The League of Conservation Voters received a $650,000 infusion from Priorities USA, one of the PACs which Hillary’s campaign illegally coordinates with.